Here’s a breakdown of 10 of the most notable moments of the winter U SPORTS season. First, some honourable mentions, including the Alberta Golden Bears winning their 16th University Cup in men’s hockey, the UPEI Panthers knocking off the No. 1 Acadia Axewomen 88-68 in women’s basketball back on Jan. 20, the Queen’s Gaels making a run to nationals in men’s volleyball in head coach Brenda Willis’ final season, the Capital Hoops Classic in Ottawa drawing 8,579 fans for the Carleton Ravens - Ottawa Gee-Gees men’s and women’s basketball clashes, and the event-record crowd of 4,715 for the Guelph Gryphons-Laurier Golden Hawks’ men’s hockey Frosty Mug game. Elsewhere, 21 athletes who competed in U SPORTS-sanctioned sports or at a Winter Universiade were part of the Canadian Olympic team, and 62 members of that team overall had ties to U SPORTS programs. U SPORTS also held presentations for OHL players about university hockey and the applicable scholarships, and once again sent an all-star team to compete against the Canadian team in tune-up games ahead of the world junior championships, which saw the U SPORTS team win both of those games for the first time. And U SPORTS live streaming continued to expand, with Canada West TV in particular experiencing major growth in subscriptions and viewership. The U SPORTS Central initiative to standardize athlete eligibility and recruitment processes has grown as well. But many of the best moments came from the sports themselves. Here’s a look at 10 of the biggest. The U SPORTS curling championships were held in Leduc, Alberta from March 24-28 as part of Curling Canada’s festival format, alongside the 2018 Canadian Collegiate Athletic Association national championship, the 2018 Canadian Wheelchair Curling Championship and the 2018 Canadian Mixed Doubles Championship. And teams from the host University of Alberta emerged triumphant on both the men’s and women’s sides, with the men’s Golden Bears taking their third title in program history (their first since 2015) and the women’s Pandas claiming their third title as well (all of which have come in the past four years). With those wins, both teams also earned the right to represent Team Canada at the 2019 Winter Universiade in Krasnoyarsk, Russia. Those titles marked a particularly impressive moment for a pair of siblings, Bears’ skip Karsten Sturmay and Pandas’ second Selena Sturmay. Karsten Sturmay and third Tristan Steinke, second Jason Ginter and lead Chris Kennedy defeated the Winnipeg Wesmen 6-4 in the men’s gold-medal game, while skip Kristen Streifel, third Danielle Schmiemann and lead Jesse Iles joined Selena Sturmay to beat the Thompson Rivers WolfPack 6-3 in the women’s gold-medal match. Karsten Sturmay was named a first-team All-Canadian too, as were Steinke, Ginter, and Schmiemann. Canada West has long been a powerhouse conference in men’s volleyball, with teams from the conference winning the last five national titles, nine of the last 10, and 19 of the last 20 (with the only exception being Laval’s win in 2012-13). But it was a surprising Canada West team that picked up this year’s title, the UBC Thunderbirds. This marked their fourth overall men’s volleyball title, but their last one had come in 1983; since then, Trinity Western, Alberta, Calgary, Winnipeg, Saskatchewan, and Manitoba had all claimed titles. So this was a big moment for the Thunderbirds. UBC won that in pretty thrilling fashion, too, taking down the two-time defending champion Trinity Western Spartans in straight sets 25-22, 25-18, and 27-25. Thunderbirds’ setter Byron Keturakis was named the tournament’s Most Valuable Player, and he posted 31 assists in that title game, while Fynn McCarthy (selected as the match MVP) had 11.5 points and Irvin Brar had 11. Both Keturakis and Brar were named tournament all-stars, and Brar also earned the R.W. Pugh Fair Play Award. Speaking of remarkable streaks, the track and field world saw one this year as well. The Guelph Gryphons men’s and women’s programs had won plenty of recent national titles each, but they swept this year’s team titles for the first time since 2007-08. That marked the men’s second-straight title and the women’s first since 2013-14. Guelph’s Tommy Land (also named outstanding male performer of the year) was named co-athlete of the meet on the men’s side (with Alberta’s Austin Cole) after claiming gold in the 600m and 1000m, while Gryphons’ head coach Dave Scott-Thomas was named coach of the year on both the men’s and women’s sides. The Queen’s Gaels and Royal Military College Paladins have the oldest recorded still-played rivalry in hockey, dating back to an 1886 game on a frozen Kingston harbor. The cross-town rivals have battled back and forth since then, and the Carr-Harris Cup was initiated in 1986, creating an annual tradition of a game with a lot on the line. That event’s seen a lot of great games over the years, but this year’s edition on February 1 was particularly special, drawing a series-record crowd of 3,524 to Kingston’s K-Rock Centre to watch what turned into a hard-fought 6-5 overtime win for the Gaels. Some of the most sustained U SPORTS dominance in recent years has come from Toronto Varsity Blues’ swimmer Kylie Masse, who won the 50m, 100m and 200m backstroke events at this year’s national championships (hosted by the Blues) for the third year in a row, setting U SPORTS records in all three. Masse was named the female swimmer of the year for the second straight season, and she picked up five gold and two silver medals overall at the event. She came, she swam, she dominated. This week’s 3-time #OUAAOTW, Kylie Masse, picked up her third straight @USPORTSca Female Swimmer of the Year award, after racking up 5 ? and 2 ? at the @USportsSwimming Championships! 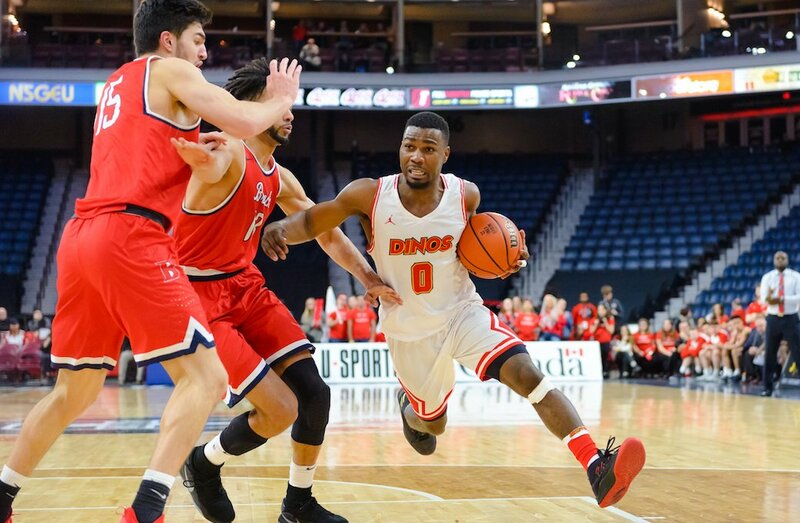 Speaking of impressive historic accomplishments, UNB Varsity Reds’ fifth-year guard Javon Masters provided one for the ages in January, breaking former Ryerson Rams’ and Calgary Dinos’ forward Boris Bakovic’s U SPORTS career record of 2,282 regular-season points. Masters hit 2,296 that evening thanks to a 39-point night, leading UNB to a 104-96 win over the Saint Mary’s Huskies. He finished with 2,407 regular-season points and was named AUS MVP, then later helped the Varsity Reds win their first conference title since 1967 and advance to nationals. They fell to McGill and Brock there, ending his U SPORTS career, but what a career it was. Javon Masters (@TheRealJMasters) broke the all-time U SPORTS men's ? scoring record on Friday night with a 39-point performance for the @VarsityReds in Fredericton. The Manitoba Bisons won their first women’s hockey national championship in March, downing the host Western Mustangs 2-0 in the gold-medal game behind 20 saves from Lauren Taraschuk and goals from Lauryn Keen (named tournament MVP) and Venla Hovi (named game MVP). But it was how they got there that was perhaps even more notable, as their semifinal game against the Concordia Stingers went to a shootout. Manitoba came up with a 2-1 win there, with Taraschuk making 21 stops during the game and then stopping both shooters she faced in the shootout. Lauren Warkentin scored Manitoba’s goal during regulation, while Jordyn Zacharias and Alanna Sharman scored for the Bisons in the shootout. Speaking of historic titles, March saw the Ryerson Rams’ women’s volleyball team claim not just the first national title in program history, but their school’s first title in any sport. And that also capped off a perfect season, as they went 19-0 in the regular season, 3-0 in the OUA playoffs, and then won all three of their matches at nationals. That included a 25-22, 29-31, 25-19, 25-21 win over the Alberta Pandas in the gold-medal game, and that crucial fourth set included Ryerson bouncing back from a 20-17 deficit. Tournament MVP Theanna Vernon led the way for Ryerson there with 11 kills and 13 blocks, while Janelle Albert had 10 kills and 28 digs and Lauren Veltman had 20 kills and 10 digs. And Vernon had some great comments about what that meant. The men’s basketball Final 8 in March saw not one, but two amazing moments. In the semifinals, the Ryerson Rams bested the top-seeded and undefeated Carleton Ravens 84-76, ending Carleton’s streak of seven straight national titles. It was yet another clash between these schools, which had faced off for the OUA championship (the Wilson Cup) in each of the past three years, with Ryerson winning in 2016 and 2017 and Carleton winning this year, and which also faced each other in last year’s national title game, with the Ravens taking that one. This time around, though, it was the Rams who wound up on top, boosted by a 28-point, six-assist showing from Manny Diressa. MBB | No more questions. No more second guessing. This is for you, @UCalgary. 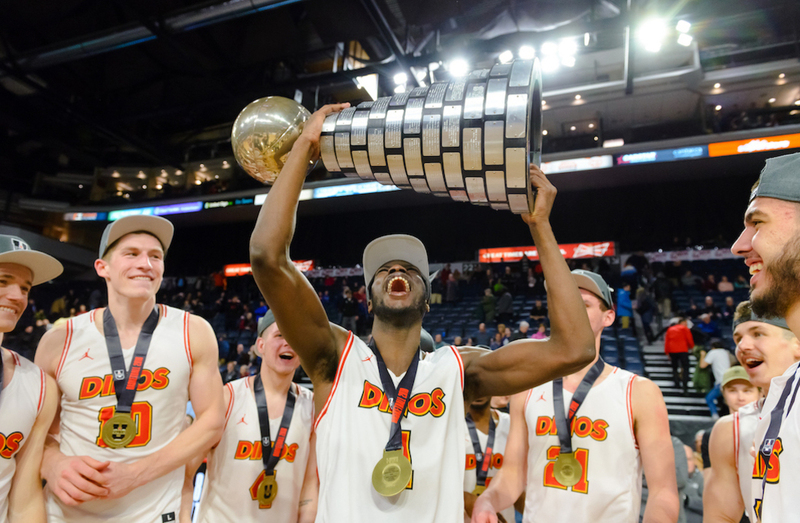 That’s a tremendous shot from Diawara, and perhaps the most memorable moment of the winter U SPORTS season.